Although it probably needs no explanation, a slice is a golf shot that curves dramatically in flight from left to right. Although there may be occasions when it is hit intentionally, it is usually the result of a fairly serious swing flaw. Every golfer that suffers from the dreaded slice knows how harmful it can be to their overall score. The most obvious problem caused by the slice is the significant loss of distance that results. After a drive that curves, say, 30 yards to the right, you are left with a considerably longer shot into the green than you otherwise would have had from much farther down the fairway. Obviously, scoring is much harder when hitting a 5-iron to the green than it is hitting an 8 or 9-iron. 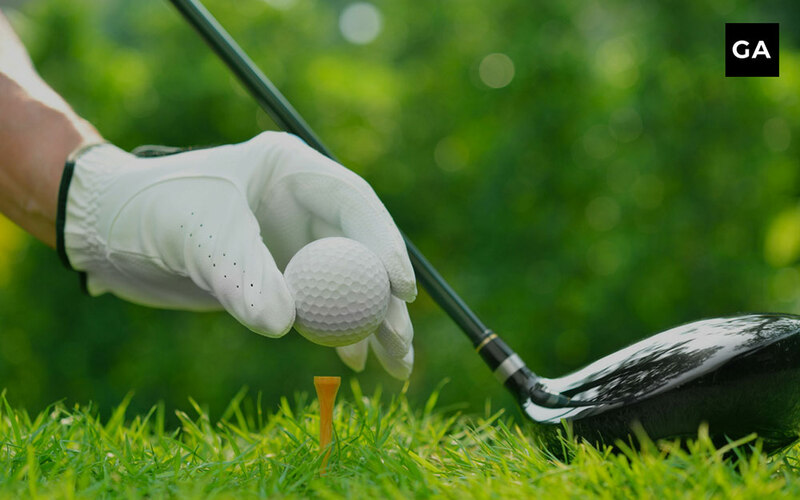 Not only is the longer distance to the hole a problem, but shots hit well right of the fairway often find bad lies in the rough, end up blocked by trees, or possibly even go out of bounds. All of these scenarios result in extra strokes that accumulate mercilessly over the course of 18 holes. And it is no consolation that most of your fellow amateur golfers are experiencing the same issue. There can be several different causes of a slice, and it is important that you determine which are applicable to your swing. Some golfers may have only one of these swing flaws, but it is not uncommon for a golfer to exhibit more than one. A competent professional will be able to analyze your swing and identify the relevant flaws. Target line – The target line is the straight line starting a few feet behind the ball and running directly through the ball to the intended target. Open or closed clubface – An open clubface is one that strikes the ball while it is aiming right of the swing path, and imparts left-to-right slice spin to the ball. A closed club face is one that is aiming left of the swing path at impact and imparts right-to-left hook spin. Simply put, the fundamental factor that causes your tee shot to curve from left-to-right is a clubface that is open relative to your swing path. Whether your swing path on any given shot is left of the target line, right of the target line, or straight down the target line, a club head that is open to that line will impart left-to-right spin to the ball which will cause it to slice. The terms “weak” grip and “strong” grip do not describe how tightly you are holding the club. These terms pertain to the positions of your hands on the grip. As you look down at your own grip at address, you will see that there is a “V” formed where the index fingers and thumbs of each hand come together. A weak grip is characterized by hand positions in which those “V’s” point directly to your chin or even to the left of your chin. Conversely, rotating your hands clockwise on the grip (to the right), so that the “V’s” point to the right of the chin or even at the right shoulder, creates a strong grip. Hands turned clockwise = strong; hands turned counterclockwise = weak. A grip that is too weak will tend to leave the club face open at impact, causing left-to-right sidespin (a slice), while a strong grip will make it easier to square the face at impact to produce right-to-left spin (a hook). If you are struggling with a slice, look at your grip as your initial checkpoint. If your grip is too weak, turn your hands clockwise on the grip, and make sure that the V’s are pointing to your right shoulder so that at least two knuckles of your left hand are visible to you. Another thing that can contribute to sliced tee shots is gripping the club too tightly. Maintaining a light grip pressure is a core element of any good golf swing, but for those who tend to slice the ball, it takes on added significance. A tight grip can prevent you from squaring the club face at impact, causing the heel of the club to lead the toe of the club into impact. This results in an open club face. Make sure you start by alleviating the tension in your hands and arms, and maintain that relaxed grip pressure throughout the swing. The aim is to have a fluid, tension-free swing that allows the toe of the club to “turn over” through the impact zone, producing a desirable right-to-left spin. As described above, there is an imaginary target line that starts at a point a few feet behind the ball and runs from there straight to the target. An out-to-in swing path is one in which the club head approaches the ball from outside that target line, and which moves from right to left as it cuts across the ball. This right-to-left swing path, when accompanied by an open club face, will produce a weak, left-to-right curving shot. Unfortunately, the majority of amateur golfers hit their drives in this manner. By contrast, virtually every professional golfer routes the club from inside-to-outside. Here’s a practice drill you can work on to ingrain a proper in-to-out swing path: On the driving range, place a head cover or other soft object about 6 or 8 inches behind the ball, directly on the target line. The goal is to hit drives without hitting the head cover. If your swing path comes from in to out, you will successfully miss the head cover and you should see more powerful, penetrating drives with much less left-to-right sidespin. However, if you come “over the top” with a swing path that is out-to-in, you will get immediate feedback as your club head hits the head cover before the ball. Doing this drill frequently will re-train you to route the club on the proper inside swing path every time. When standing at address prior to swinging, it is useful to check the alignment of your shoulders. A good way to do this is to take your club and place it horizontally along your chest. The club will “point” to where your shoulders are aimed, either right or left of the target line. It is important to understand that your swing path will almost always mirror your shoulder line. If your shoulders are pointing left of your target line, it is likely that your swing path will also go to the left (out-to-in). You should exercise care in making sure that your shoulders are properly aligned down the target line, or even slightly right of the target line, to encourage an in-to-out swing path. Modern driver technology has provided an easy fix for golfers looking to minimize or eliminate their slice. Almost all drivers nowadays have adjustable features that allow you to minimize your swing flaws. Loft angles can be changed, along with face angles and swing weight. However, surveys have revealed that 66% of the golfers who already own an adjustable driver don’t take advantage of the adjustability features. This means golfers are missing out on consequential improvements that can make the game easier and much more fun for them. Slicers can alter the face angle on their adjustable driver so that it is more “closed,” offsetting the negative effect of the open club face that they now struggle with. Loft can also be modified. Insufficient loft has a tendency to impart a greater amount of sidespin, which can exaggerate your left-to-right ball flight. Greater loft on a driver will generate backspin and lessen the slice-inducing sidespin. A little time spent on the range tinkering with these adjustments, can turn that unwelcome slice into a manageable fade, or in the best-case scenario, can eliminate it altogether. The reason we all play golf is to have fun and let’s face it, lowering your score is a guaranteed way to make the game far more enjoyable. Getting rid of that unwanted slice by implementing the swing changes we’ve discussed in this article will make your rounds much more satisfying….and will lower your handicap in the process. Now that sounds like fun.